Walking with Jesus: Day 5: Matt. 3:1-12 & Psalm 5 - What is True Repentance? Day 5: Matt. 3:1-12 & Psalm 5 - What is True Repentance? We see a strong emphasis on repentance in today's Gospel reading. John the Baptist came preaching repentance and baptizing with a baptism of repentance. In the response of the people, we apparently see examples of true repentance and false repentance. Those who were truly repentant came "confessing their sins" (v. 6), but apparently the religious leaders were coming just to make an appearance, to put on a good show. 1. True repentance bears "fruit in keeping with repentance." 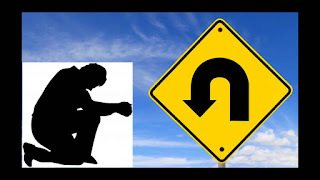 Because true repentance involves a deep change of mind and heart, a change of direction and heart-orientation, true repentance will bear fruit. This isn't a matter of perfectionism, but a sincerity, humility, confession of sin, hunger and thirsting for righteousness and love for the Lord and for others. Repentance leads to a realization of our poverty of spirit before God and results in a meekness, gentleness and sincerity summarized by Jesus in the Beatitudes. 2. True repentance doesn't trust in pedigree but openly confesses sin and need. The Pharisees and Sadducees were trusting in their position as children of Abraham, hoping to claim standing before God based on their heritage and their position. But the genuine people came confessing sin, acknowledging their need for mercy. 3. True repentance knows that salvation is the supernatural work of God. "God is able from these stones to raise up children for Abraham." And that is what God must do with our hearts, which are naturally stony and hard. He must transform us. Repentance is a free gift of God's grace. It requires supernatural intervention and transformation, and we cannot have it unless we realize we cannot produce it in ourselves. The good news is that God does grant repentance and salvation by His mighty power! He is the God who judges and He is the God who saves. All glory and honor belong to Him! Father, You have welcomed me into Your presence by Your steadfast love, not because of any righteousness of my own. Hear my cry, O Lord, for my enemies surround me with lies constantly and I am tired of hearing them. My restless flesh lies to me all the time, craving and coveting and envying and complaining, when I should be rejoicing and giving thanks and finding contentment. Satan whispers doubt and despair in my ears, saying that You cannot be trusted or else I cannot be redeemed. Get these lies away from me, O Lord. Hear my cry! You are my refuge, O Lord, and in You I can rejoice and give thanks and find real protection. You do lead me and You do guard me. You bless those whom You declare righteous in Christ, O Lord, and You do surround us with Your powerful favor, like a shield all around us. I rejoice and exult in You through Jesus, my Savior, Amen!